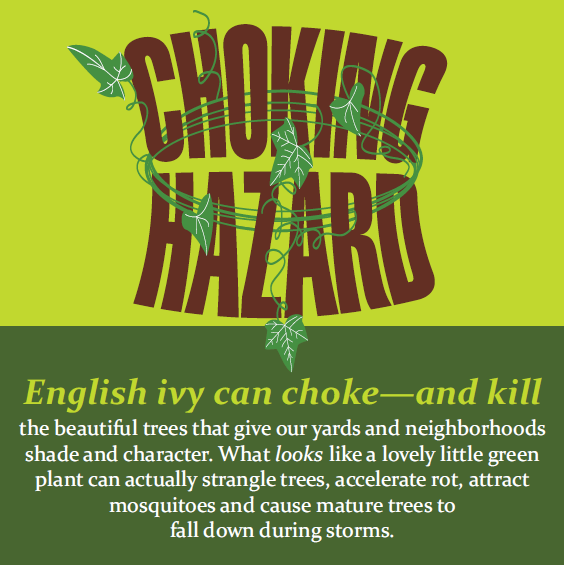 English ivy can Choke – and kill the beautiful trees that give our yards and neighborhoods shade and character. What looks like a lovely little green plant can actually strangle trees, accelerate rot, attract mosquitoes and cause mature trees to fall down during storms. 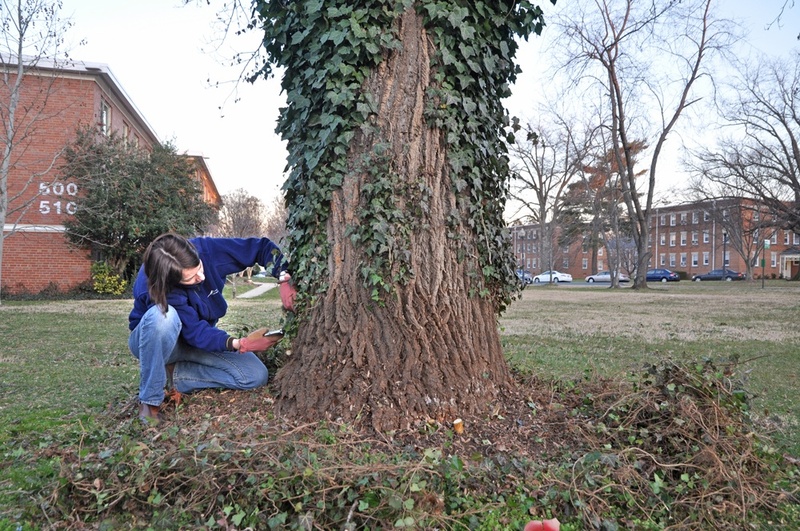 Use garden clippers to cut ivy at the bottom around the entire trunk of all infested trees. The goal is to separate all ivy vines from their source of nutrients in the soil so they will die. If the ivy is not dense, you can pull it from the soil at the bottom of the tree with your hands, especially the day after it rains. On heavily infested trees with ivy vines thicker than an inch, you will need to carefully saw through the vine and carefully, gently ease it away from the bark. Experiment with the tools below to find what works best for you. TIP: Wear gloves and long sleeves to lessen the risk of poison ivy. Many prefer doing this during the winter months when poison ivy is less virulent, and they will have heavier clothing to reduce the risk. 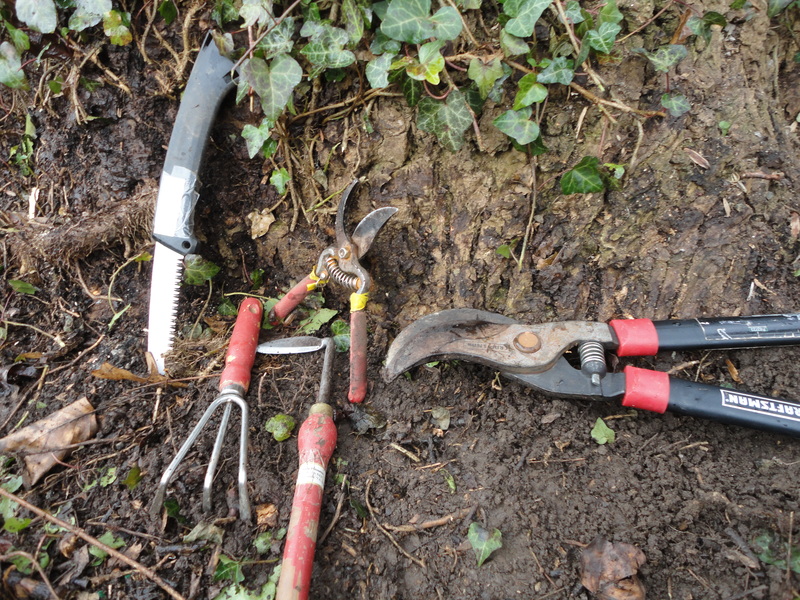 Pull all ivy vines out of the ground around the base of the tree, making a 2 feet “life saver ring” around the tree. This will protect the tree from future infestations. This is easiest to do when the soil is soft from rains; if the ground is very hard and the vines keep breaking, wait until after a rain to remove the vines. The cleared space allows you to see any emerging ivy from roots you missed. Arborists suggest laying a 2″ thick leaf or wood chip mulch for three feet around the tree to preserve moisture in the soil and keep lawn mowers from getting too close to the roots. Keep the mulch 3″ away from tree trunk to ensure air exchange for the bark, and you can spot any ivy trying to reinfest the tree. Once cut, leave ivy on the tree. Do not pull it off because that could harm the tree. Ivy will gradually blend into the tree bark after it is cut. Check up your tree each winter to be sure the ivy remains off. Contact info@TreeStewards.org to get a demonstration on how to remove ivy from a tree in your yard. TreeStewards are trained volunteers from your community who share their tree knowledge. Download a PDF presentation to share. These materials were developed for TreeStewards and Arlington Regional Master Naturalists under a grant from the Tree Canopy Fund of Arlington, Virginia. These materials, created by Biodiversity Project of Chicago, may be adapted and distributed by anyone who wants to protect their trees. Looking for evidence that ivy kills trees. I linked to this page on https://colinpurrington.com/2018/11/kill-english-ivy. I just linked to your 40 Reasons article. I wish the world would heed your excellent advice. I have a huge 50+ foot sycamore at the end of my garden and ivy had gone right up about 40 feet. I borrowed a small chainsaw from a friend (some of the ivy trunk was 4+ inches in diameter) and the tree now has a 5 foot zone from the ground up with no ivy at all so I’m looking forward to the ivy dying and gradually coming off. If the vines completely gird the tree, and they are thick so that you don’t wanna strip them off vertically, I don’t advocate it but I have had success with a dremel and a a circular blade, but with a chainsaw I don’t know. I don’t use chain saws. I mean, the procedure calls for first doing no harm, and that means gingerly being cautious and careful especially about the tree’s skin. The ivy roots on my tree were a good four inches in diameter so a Dremel wouldn’t have touched them. Rest assured I was extremely careful with the chainsaw and never touched the actual tree. According to an article on the BBC’s website, I’ve does not kill trees and provides food and cover for much wildlife and insects,birds, bats etc. They say that unless the tree is structuraly unsound, there is no need to remove it. Worth consideration . I understand, but that’s Britain. They may have different terrain, or different trees. Me? I live in a doggone swamp. What I’ve observed in No. Va. is that the ivy traps moisture against the tree, causing the bark to rot. If that alone doesn’t kill the tree, it leads to invasion by bugs in the rotted part, which can also kill the tree. BTW I originally pulled ivy off the trees. The past few years, I’ve been cutting the space and yes, it dies off quite nicely and the vines drop or blow off the trees. My opinion: All rules have exceptions – errors can change in importance – but look at a tree covered in ivy. It depends on the context, and look around the tree; clearly the ivy is “taking over.” That’s not intended by nature, maybe not really what you would see in, say, old-growth forests. In secondary places, symptom of human intervention is plant invasion, and remedy is indicated. You’ll notice the extent of invasion of the non-native plant, and you will do your best to avoid spread of same if that area is important to you. And contrary to recent statements in that bbc report, I have seen trees ruined by ivy; when it circles and squeezes the bark, it disrupts the xylem/phloem processes among other factors mechanical/physical. There are worse offenders than English ivy other: celastrous, the wisterias, not really VA creeper. And poison ivy taking over a tree, I think, is equal parts obnoxious to the tree as the visitor. It’s a matter of degree is all. English ivy is a native plant there and that’s a factor in different behavior and interactions. I’d challenge anyone who thinks ivy is harmless to trees to visit Richmond and see what it’s done to our parks. Watching birds extract insects out of bark and access nesting holes in healthy trees not engulfed in ivy begs the question of how they would easily do this on ivy-smothered trees. Ivy, as ground cover, also eliminates diversity of native plants and their food sources which our native insects and wildlife depend upon. There is research that suggests food sources from invasive and non-native plants does not provide the nourishment birds, particularly in the case of migratory species which also depend on phenological timing of food sources. Do you know of a No Ivy League in Alexandria, VA? I have not heard of the No Ivy League in VA, but I’m excited to hear about it. I am on the West Coast of California—our group is the Humboldt No Ivy League—we are a small group of dedicated volunteers with California State Parks. We have been working to remove ivy in Trinidad State Beach and Patrick’s Point State Park for the past 9 years. We have made some terrific progress, but the ivy infestations are severe and will take years to get rid of. It is so rewarding to see the native plants return in abundance once the ground is liberated from ivy. Thanks for the article! It’s been really helpful at removing the ivy from our Rockefeller size tree. The one thing we noticed is that the ivy has really spread throughout our backyard and neighborhood and is REALLY old. So when we are trying to remove the roots around the tree, they seem a bit too deep to get to. Any recommendations for how we can safely, even gradually prevent the ivy from growing back if we can’t get to the roots. It may be a bit longer of a process. It’s hard to get big roots, but just keep tugging. Sometimes they give way at a weak point. Often they do not. In that case, sever them with a soil knife or loppers. And be sure to return year after year to repeat your cutting. Be vigilant. If they don’t have sunlight, they’re doomed. No leaves, no climbing, no problem. We have a large old oak tree and only about 1/4 branches are getting leaves. If we cut ivy and follow your steps will it revive itself or is it too late? It might, but only if you remove the ivy. If, next spring, it does not leaf out more fully, please consult qualified arborists (get 3 opinions) before you give up on the tree. We have two beautiful old oaks on the property line between our home and our neighbor’s home. The trees are closer to our house than theirs and have been neglected to the point that there are ivy vines with 8″ diameters. We were given permission to remove the ivy because everyone is in agreement that the trees are in danger. We have severed the ivy ‘trunks’ but I am worried that the ivy is so old and dense that it has developed a root system higher in the tree than we can reach. I work with a group—the No Ivy League—in Coastal Northern California that is working to get rid of English ivy in our State Parks. A main priority for us is to liberate the numerous trees (Sitka spruce, Redwoods, Alders, etc.) that are being engulfed in ivy—some with large stems like you describe. Once you sever the stems around the trunk, the ivy will dry up pretty quickly. While some ivy stems may have rooted in the crotches of the tree in some places, it’s doubtful there would be enough soil to sustain ivy to the degree that it is being sustained from the ground. The very best thing you can do is cut the ivy stems around the tree and watch, with satisfaction, as the ivy drys up and the tree is liberated from the strangling effects of the ivy. Never fear, Bobbi. Ivy on the trunk will die if at least one foot of growth between the ground and what remains on the trunk is both severed and very gently removed from the bark. Some folks like to cut ivy at the base of the tree, clearing the “life ring” from the base, and then standing up and cutting all the ivy at chest height, very gently the ivy stems downward and off the tree. The idea is to make the cut so large that the ivy will not regrow into its remnants on the tree. If ivy loses contact with the ground, it will die. It may take awhile, but it will happen. Check your trees annually and remove any new growth. Thanks so much for the informative article. I have pulled ivy off trees now knowing the harm I was causing. What ground cover that is not harmful to trees would you suggest instead of ivy down slopes that also house trees? We also have dogs so hopefully somewhat sturdy ground cover that would keep the soil for the trees on the slopes. Sedges native to your area will hold soil on the slope much better than ivy and doesn’t require cutting. You could, if you want to, cut sedge twice a year. Aside from that, it’s carefree. Not sure how it acts with dogs; they both tend to flop a bit. But try it. The dogs may love it. I did as you told above and within just two days all of the vines have wilted and look to be dying quickly. I had previously cut the vines, but it didn’t quite work. I ripped out the roots after a big rain about 1 foot away from the tree. I’ll be adding mulch soon. The oak tree has been shedding small twigs off the ends of the branches, a sign of stress, so I wanted to move quickly on killing the vines. I was grateful that you recommended a way that doesn’t involve chemicals. I am a resident of DC and would’ve had to call a tree doctor soon if I couldn’t take care of this myself. Thanks for the huge help! Once I clip the numerous thick 1″ thick vines at the base of this 75-100 year old black poplar, given the tough thick bark of the tree, do I leave the vines on or pull them off the trunk? I tested by pulling one vine and it did not seem to pull any bark. I am concerned about the upper bark being thinner. The local arborist said ok to pull as this bark would not cause harm. Feedback welcomed. Oops, sorry we overlooked your question. You were correct to carefully check the bark when first removing as the bark is like the skin — you don’t want to damage it. We generally recommend leaving the vines/ivy growing once cut and they will dry out and be blown away. Also, we’ve seen some folks who really, really tug on the vines and can do significant damage to the bark. Our general way to ensure all ivy vines are removed from 3 foot height to the ground so we can be sure every vine is removed. Sometimes one overlooks one vine and the ivy keeps alive a year later…then we have to go back and make sure to get it all. As long as you keep checking the bark is not coming off or being ripped, you are ok. Glad you’re doing this! Thank you for the article. We just moved into a house in Ventura CA, and there is a beautiful flowering tree (unidentified at moment) that is strangled by ivy. The base of tree has very large old ivy vines around it and it is completely entangled above in the canopy. The tree is still flowering and seems healthy so I will work on it at base immediately, and over the next year I will gradually attempt to remove the dense vines above. Who knew you could get a rash from this type of ivy! Thank you for informing me. I removed some vines the other day and now wonder if the slight rash I have is from the ivy. Thank you for reminding us of the goal:right tree for right place, right garden for right place. I agree with DC Arborist. We’ve lost a great deal of canopy cover throughout the US. We can start at home by maintaining the old growth trees we have and adding trees where appropriate. Also, when thinking about ivy’s impact, also consider eliminating solid canopy cover so gardens can grow……..massive tree canopy prevents sustainable urban agriculture and healthy nutrient initiatives. Tree canopy and gardens do not have to be mutually exclusive. Just follow the rule: right tree for the right place, right garden for the right place.